There’s an angel on the top of my Christmas tree. She’s graced it every year since I painted her in 1989. There is an angel that my daughter made in Girl Scouts. There are bells made into angels, and several angels that I have no idea where they came from. Possibly presents for or from my kids, maybe some from Cub Scouts when I was a den leader. They have white gowns, red ones, and blue ones. One angel is just clear, with golden wings. One look and anyone can tell they are angels. Bright and shiny. One figure on my tree is a bit shabby, though. Her gown overlay was originally blue, but is very faded now. Her clear wings, that once stood proud, as though she had just landed on the tree limb, now have sharp points on them where they have torn. The blue stars are still very visible on her wings. Her once white halo has been replaced with iridescence. Her ‘hands’ still hold the yellow candle, although they, too, have been replaced. Her wooden head with the painted eyes and mouth, has been scrubbed clean. Her entire body holds the remnants of Christmas’ past. Canned snow has been cleaned from her, but has left reminders all over her. This angel holds a special place in my heart because of how I received it. I was about 8 years old that Christmas. My Aunt Ginner handed me a present and this angel was attached to the top of it as a wonderful decoration. It was the only such decoration on any of the presents. She had given it to me as a special item. Ginner had no children of her own, but was a special person to all her nieces and nephews. The only other niece was 18, married, and lived out of state, so I was the ‘chosen child,’ being the only girl in a groups of boys. As a kid, Ginner was my favorite aunt. She played with us as children, and enjoyed being silly and childish with us, not stuffy and all grown, like her sisters. 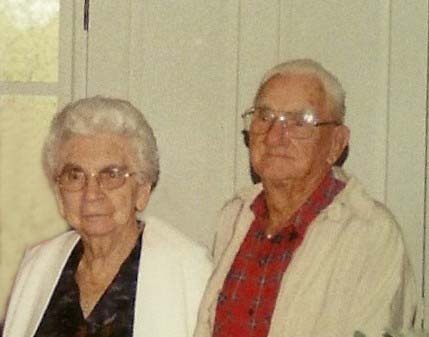 ‘Ginner’ was born Virginia Lee Benefield on 4 May 1929 in Randolph Co, AL. She was a teacher, a child care worker, and was loved by all her family. She passed away on 26 Aug 2010 in Jefferson Co, AL. That one little angel may not look like much to anyone else, but to me she’s a special memory. 52 years ago today, my great-grandfather passed away. The date was 2 Jan 1964. He was 90 years old, being born on 16 Nov 1873, in Talladega County, Alabama. I was a child at the time of his death, and have only one memory of him. He was sitting in a chair in his front yard, much like the photo here, which could have taken at the time of my memory. Oscar L. Gaither had six sons and one daughter with his wife, Percilla Adline Gurley, whom he married in 1896 in Clay Co, Alabama. Oscar was the oldest of eight children, and his family was a close one. By 1900, he had bought a farm, and lived next to his parents and his five youngest siblings. His other two brothers were also married, and lived next to the rest of the family. Although he is listed on most census reports, Oscar, and most of his brothers managed to hide during the census taker visits in 1910. He is listed on the Clay County tax lists, so I know that is where he lived during that time. 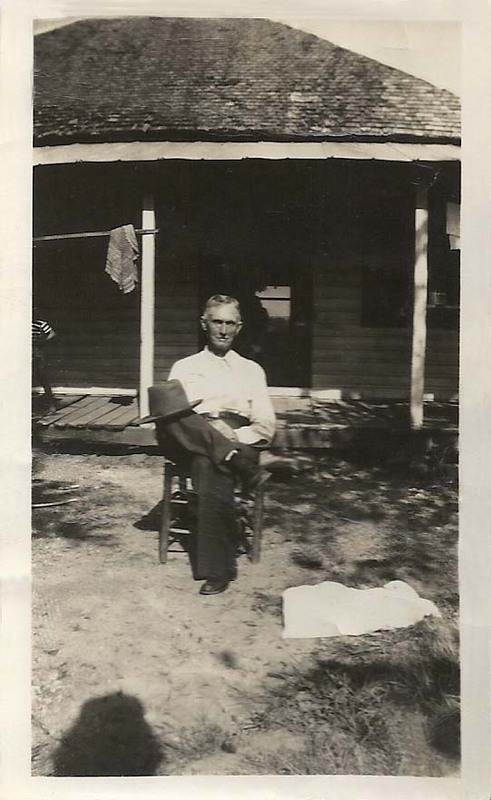 In 1920, he is still in Clay County farming for a living. At some point in his adult life, he started a dairy farm. I haven’t found any records on it yet, but I have been told they exist. As further proof of this endeavor, the information is recorded for all posterity on the 1930 census for Talladega County. In 1940, he is listed as being a farmer, but his son, Francis (aka Bud), who lives with him, is listed as working on a dairy farm, so I suspect Oscar is the owner. Although Oscar never served in the military, he did register for the WWI ‘old man draft’. He was 44 at the time, and his name is listed as Oscar Lafayette Gaither. Apparently, the person who filled out the form had never heard the name Levert, and wrote what they wanted to. The signature on his card is a different handwriting, so I know Oscar did not fill out the card. In 1945, he requested a duplicate of his Social Security Card, and filled out the card, himself. He printed, using capital, block letters, and with one exception, all his ‘N’s’ were written backward. He listed his name as simply Oscar L. Gaither. 4 generations of Gaithers l to r: L.T., J.L., W.L., and O.L. There was a huge snow storm across the country two days before his death, and I don’t think the local newspaper was published for a day or two during that time. I did manage to find an obit in the neighboring newspaper, though. It stated that he ‘died Thursday morning at Citizens Hospital, after a long illness’, which his death certificate lists as pneumonia. Oscar and his wife are buried in Providence Baptist Church Cemetery, Guntertown, Clay Co, AL. Since starting genealogy, I have found out quite a bit about this man, although I wish I knew more. 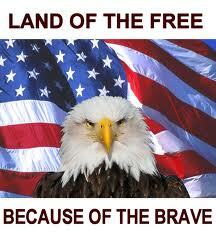 This blog is dedicated to all the military men in my family, which includes my husband’s family. I am sure there are many more that I do not know have served, especially cousins and uncles. As to date, I have found no female military in my family, although I know the wives of these men also served along with their husbands and mothers along with their sons. Sometimes it’s harder to watch the people we love give of themselves than it is to give ourselves, so I do not want to forget the families of those who served, for they, too, served. All of these men are blood related to my children, and for the futures of them and their children: I THANK YOU! This weeks’ suggested theme is, ‘Heirloom’. I have several items that I acquired from my grandparents, and a few quilts that my great-grandmother made. All of these items are special to me, so it was no easy task to settle on only one. In listing the items; dishes, lamps, knick-knacks, doilies, furniture, pictures and personal items, I finally arrived at one special item. 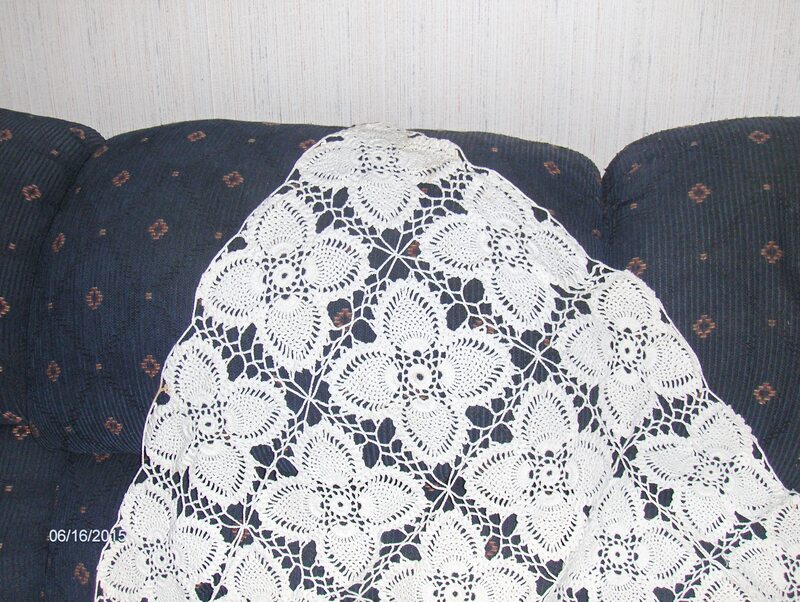 Just looking at the crocheted bedspread, no one would think it was anything special. It has no unusual design, no awesome colors, and no unique border. It’s an ivory color, and made to fit a full-size bed. The pattern is a loose design, so a colored sheet needs to be placed under it so it shines on the bed. My grandmother, Thelma Gaither, gave it to me in the 1980’s when I was in my 30’s. When gifting me with this special present, she told me the story of how it came to be. It had been in the bottom of her chiffarobe since she made it in the fall of 1958. It was to be a Christmas present for her youngest son, my Uncle Louie. He and his only child, a daughter, who was 1, were killed in a traffic accident in November of that year. She had kept it packed away in her chiffarobe all those years. By the time all the grandchildren were born, I was the only remaining granddaughter, along with five grandsons. As she gave me the bedspread, she admonished me to not tell anyone. She didn’t want to cause hurt feelings or be accused of playing favorites among the family. She wanted me to have it because I was her only granddaughter, not because I was her favorite. (I think she also thought I would take better care of it than the boys. haha) Most of my family members have access to this blog, so if Grandma hadn’t already told others, the story is now out. The bedspread has only been used a few times since I received it because I want to preserve it. It means a lot to me that my grandmother wanted me to have something so special. It now resides in the same chiffarobe in which she kept it for so long. 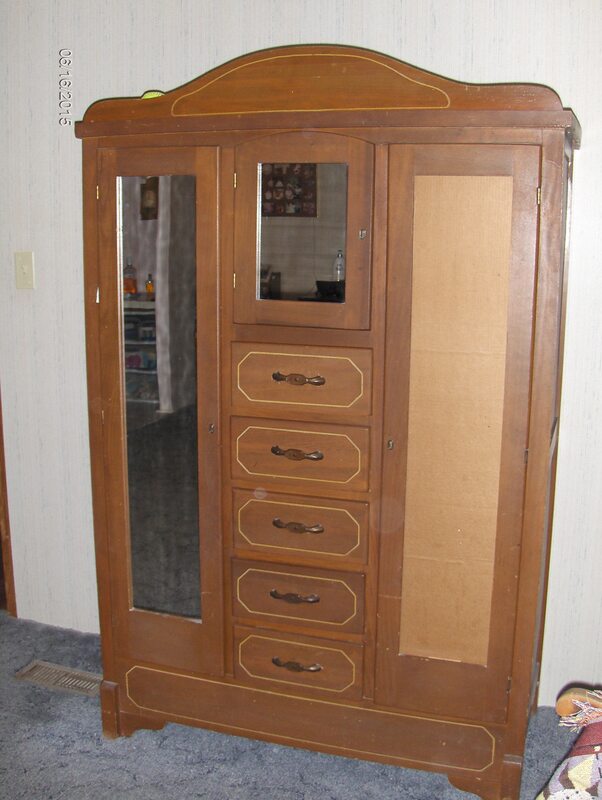 The chiffarobe is another heirloom from my grandparents. The mirror on the right side is broken, and has been for as long as I can remember. When she gave it to me, she told me she had started to replace it, but since my brother and I had broken it when we were kids, she would just leave it up to me to replace! OH! How I loved that woman! 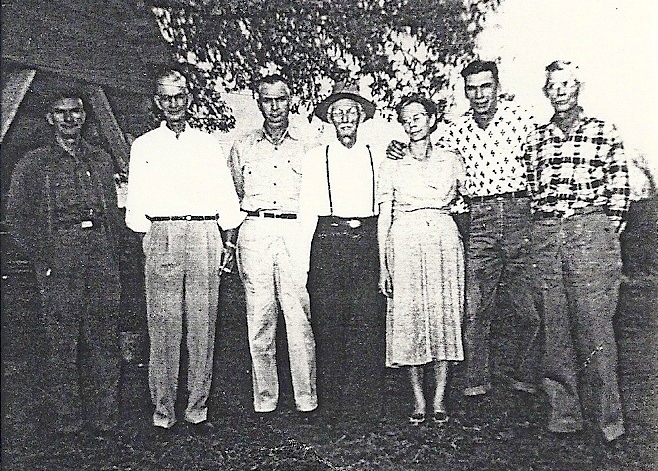 For the most part, my grandfather Gaither’s family lived long lives. He and his siblings were born in a time (1897-1918) when the life expectancy of men was 47-55 years, and it was only slightly higher for women. His father, Oscar, born 1873, had a life expectancy of 44 years, but more than doubled that by living 91 years. I have only one memory of him, as I was a child when he died, and we lived in a different city. I can recall him sitting in a chair in his front yard. That is the only thing I remember, nothing about the circumstances, nothing about him, just have that image in my head. I also have a photo of him just like that. Perhaps that was when the photo was taken. Oscar and his wife, Pricilla, who lived to be 70, had seven children and all but one surpassed their life expectancy. Erie, better known as Pete, was the centenarian of the bunch and still very active in his 90’s. The following stories happened during that decade. He was 91 when his sister-in-law passed away. She was buried in a local church cemetery, next to her husband. When most of the family had left, and the graveyard workers began covering her grave, Pete grabbed a shovel and began helping. It was the last act of respect he could show to his brother’s wife. My cousins and I visited Uncle Pete to ask about family history and arrived at his home about 10:30 in the morning. At least it was morning for us. The house had the aroma of fried fish. Uncle Pete had already been to the river, caught a ‘mess of fish’, brought them home, cleaned them, fried them and had already eaten them for lunch. That man had more energy before noon than I had all day, and he was 50 years older than me! Uncle Pete loved to take his boat and go fishing, usually alone. The biggest problem with that, was that his family would usually have no idea of where he went or when he left. Eventually, he had to give up his truck keys to keep his family from panicking when he got the urge to travel. Most of us dream of living a long life. Maybe we should be more interested in making the years we do live more productive, like Uncle Pete. Instead of one ancestor, for this week’s challenge, I chose the two surnames that are the most important to me. My mother’s maiden name, Benefield, and my father’s surname, (my maiden name), Gaither. Both of these names are easily read and pronounced, but difficult for others to spell. Usually a letter or two is left out or added. 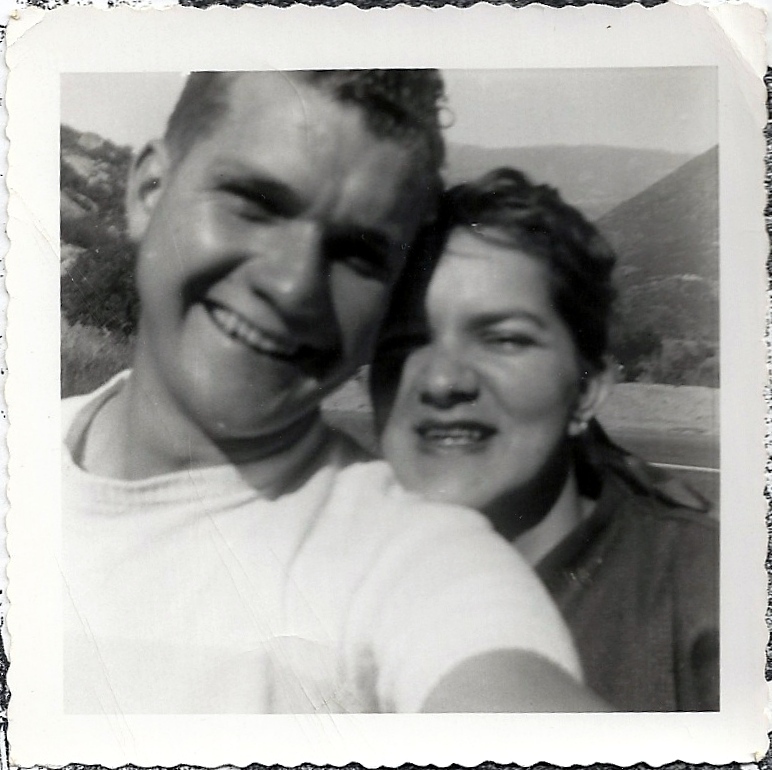 My parents self picture, before ‘selfie’ was a word. For this blog, I wanted to go with the theme of ‘Luck of the Irish’ to celebrate St. Patrick’s Day. I was planning to write about my two pair of ancestors, the McKee’s and the McKay’s, who both arrived in the United States from Ireland on the same ship. Their children married and, thus started the American branch of the McKee’s. Sounds romantic, doesn’t it? Unfortunately, that is not what my research proves. Apparently, someone kissed the blarney stone one too many times. The McKay side of my family is actually from Scotland. Blogs about them will be at a later date. At least the McKee’s did come from Ireland. In researching this branch, I have not found a lot of information on them, but here’s what I have found on my 5th great-grandparents. William and Jane McKee were both born in Ireland. From their departure port, it is assumed they were from Northern Ireland, however, some have questioned this and stated that just because they sailed from there does not mean they lived in the area. There are McKee’s in other areas and it is possible they could have been from one of those areas. We may never know exactly where in Ireland they are from. They came to the Colonies in the Brigantine Free Mason. The Free Mason (Freemason) sailed from Newry, Ireland on 27 Oct 1772, and arrived in Charleston, SC, on 22 Dec 1772. It was the last of the five ships in the emigration led by Rev. William Martin, all of which sailed in 1772. The first two sailed from Larne, the next two from Belfast, and the last one from Newry. The emigrants settled throughout western South Carolina, many in the Abbeville area. Most of the passengers left their homes because of escalating rents and the rising costs of living at home. The governor wanted to populate South Carolina, so they offered free land and a bounty to anyone willing to settle in the colony. Many responded to this offer. The bounty was discontinued in 1768, but the land grants were still in force in 1772 when this group set sail. William McKee is listed as the head of the family and received a grant for 250 acres on 6 Jan 1773, according to the Council Journals of South Carolina. This represents 100 acres for him, and 50 each for a wife and a child, so it appears that he and Jane brought two children with them. Although the land was free, there were fees associated with the filing, surveying, recording, receiving copies of the results, and several others. These fees were quite extensive, and many of the people could not afford the fees for several years. They had to work for others during that time, to earn money to live and save for the fees. Once the fees were paid, they were awarded the tract of land, however, it was usually far from the town area, and not likely to be near other settlers. The goal of the governor of the colony of South Carolina was to get the entire area settled and having people living close together wasn’t working to that end. I am looking for information as to whether William may have served in the Revolutionary War. So far, I have found none. William’s birth date is unknown, but according to his grandson’s Bible, he died on 15 May 1813, SC. Jane died 23 April 1835, at age 76 years and 4 months. Their daughter, Martha, my 4th great-grandmother, was born Feb 1798. She is listed on the 1870 Clay Co, AL census as 71, born SC and her father and mother were both of foreign birth. Many questions remain about this family. More research is needed to pull out details of this emigration, and the family of William and Jane McKee. No matter where they originally lived, I am grateful they made the arduous trip across the wide-open seas to the colonies.